Pulse cauliflower in a blender until reduced to rice-sized pieces, working in batches as needed. Transfer to a large bowl. Sprinkle with oregano, turmeric, and cayenne pepper. Mix well. Pound chicken to 1/2-inch thickness. Season with black pepper, paprika, and 1/4 tsp. salt. Bring a large pot sprayed with nonstick spray to medium heat. Cook chicken for about 4 minutes per side, until cooked through. Transfer chicken to a plate, and cover to keep warm. Remove pot from heat; clean, if needed. Re-spray, and bring to medium-high heat. Add bell pepper and onion. Cook and stir until mostly softened, 6 - 8 minutes. Add tomatoes, cilantro, garlic, and remaining 1/2 tsp. salt. Cook and stir until tomatoes have softened, about 3 minutes. Add seasoned cauliflower rice, peas, chicken broth, and bay leaves. Bring to a boil. Uncover pot. Cook and stir until cauliflower rice is tender, about 4 minutes. Remove and discard bay leaves. Serve chicken over rice. HG Alternative: Instead of blending 4 cups of roughly chopped cauliflower into rice-sized pieces, use 3 cups premade cauliflower rice or crumbles, like the kinds by Trader Joe's and Green Giant. 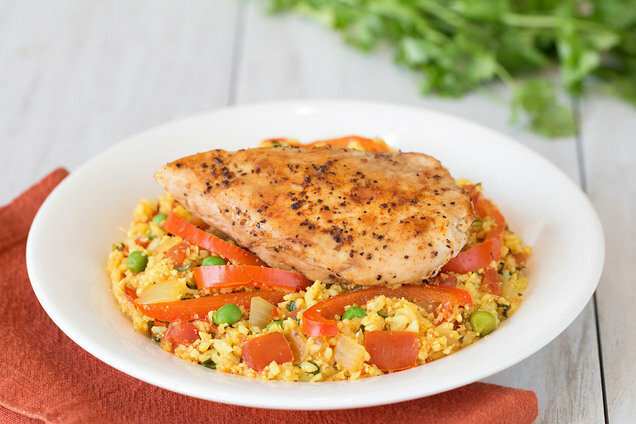 Hungry for More Cauliflower-Rice Recipes? Today, September 27th, is National Chocolate Milk Day. Channel your inner child with 90-calorie mini cartons of So Delicious Chocolate Coconutmilk Beverage.